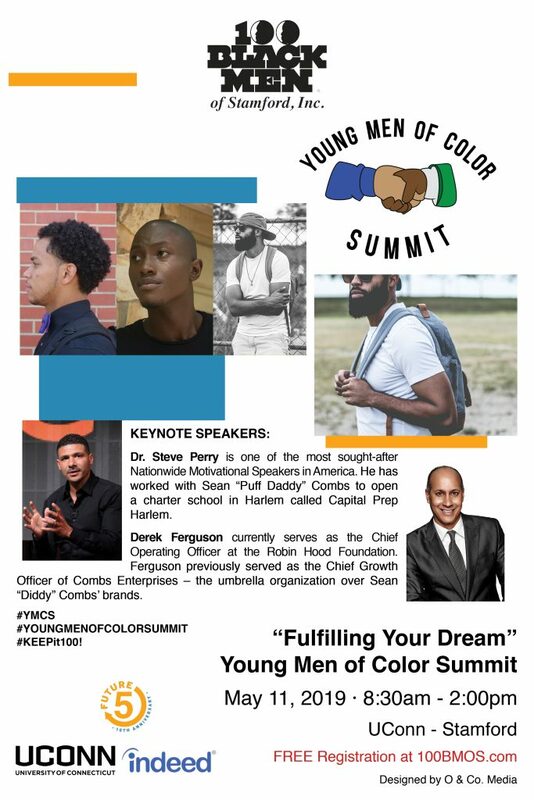 The 100 Black Men of Stamford and Future 5 are jointly planning a major initiative to bring together minority students from the greater Stamford area for a Fulfilling Your Dream Youth Summit. It is anticipated a population of 100 to 125 Black male (primary target) and female youths will attend. This special event is scheduled for May 11th at U. Conn/Stamford and designed to accomplish two critical objectives. First, provide targeted high school students with a path to identify broad concepts of success and creating a positive and practical vision for their future. There are many more career choices besides becoming a professional athlete or entertainer that are truly sustainable. It is critical to expose these young men to a variety of options available.Second, inspire a new mentoring initiative that will partner directly with the Stamford Public Schools. The concept is to have regular bi-weekly interaction with a group of approximately 25 students jointly selected in consultation with school leaders. Only 11% of college students correctly answered these 4 money questions—can you?